en route to New York City, U.S.
Paul Francis Kossoff (14 September 1950 – 19 March 1976) was an English blues rock guitarist. He was most notably a member of the band Free. He was ranked 51st in Rolling Stone magazine's list of the 100 Greatest Guitarists of All Time. Kossoff was the son of Margaret (Jenkins) and the English actor David Kossoff. His father was of Russian-Jewish descent. Kossoff started playing the guitar in the mid-1960s, being taught by session guitarist Colin Falconer, and at the age of 15 was a founding member of the band Black Cat Bones. The band played with touring blues piano player Champion Jack Dupree, often supporting Fleetwood Mac and other gigs with Fleetwood Mac co-founder Peter Green. Kossoff's bandmate in Black Cat Bones was drummer Simon Kirke, and the two went on to play on Champion Jack Dupree's April 1968 album When You Feel the Feeling You Was Feeling. In April 1968, Kossoff and Kirke teamed up with Paul Rodgers (vocals) and Andy Fraser (bass) to form Free. They toured for two years, during which they recorded two albums: Tons of Sobs (1968) and Free (1969). Both albums showcased the band's blues- and soul-influenced sound, a style that was in contrast to some of their progressive and heavier counterparts at the time. Success came in 1970 when their third album, Fire and Water (1970), spawned the hit "All Right Now". The band played the Isle of Wight festival to both audience and critical acclaim. Sellout tours in the United Kingdom, Europe, and Japan followed, but after the release of the next album, Highway (1970), band pressures led to a split. The live album Free Live, recorded in 1970, was released in 1971 as a farewell record. While Rodgers and Fraser pursued unsuccessful solo projects, Kossoff and Kirke teamed up with Texan keyboard player John "Rabbit" Bundrick and Japanese bass player Tetsu Yamauchi to release the 1971 album Kossoff, Kirke, Tetsu and Rabbit. Free reformed and released the album Free at Last (1972). Following its release, Fraser decided he had had enough, and quit to form Sharks. Free drafted Tetsu and Rabbit for Free's 1973 album Heartbreaker (1973) after which the group disbanded. Rodgers and Kirke went on to form the successful Bad Company while Kossoff released a solo album, Back Street Crawler (1973). He then accompanied John Martyn on a 1975 tour before assembling a group called Back Street Crawler. Back Street Crawler released two albums: The Band Plays On in 1975 and 2nd Street in 1976. Recordings from one of the band's UK concerts in 1975 were also released under the title Live at Croydon Fairfield Halls 15/6/75. Kossoff's guitar playing was also much in demand for session work and he contributed solos on several albums including: Jim Capaldi's Oh How We Danced (1972) and Short Cut Draw Blood (1975); Martha Veléz's Fiends and Angels (1969); The Amazing Blondel's Mulgrave Street (1974); Uncle Dog's Old Hat (1972), Michael Gately's Gately's Cafe (1971) and Mike Vernon's 1971 album Bring It Back Home. In 1977 a 16-track career retrospective, Koss, was issued posthumously. He also played on four demos by Ken Hensley (eventually released on the 1994 album titled From Time to Time) and three tracks that appear on the CD-only issue of John Martyn's Live At Leeds album from 1975. In 2006, an unreleased guitar solo surfaced on the title track to the album All One by David Elliot, who recorded with Kossoff in the 1970s. In 2011 a selection of early recordings Kossoff made with Black Cat Bones was released on the album "Paul's Blues". The late 1990s saw a renewed interest in Kossoff, and another career retrospective was released, 1997's 14-track Blue Soul (actually a reissue of a double vinyl release from the mid-1980s of the same name), as well as the five-disc Free box set Songs of Yesterday. In 2000 a Free biography entitled Heavy Load: The Story of Free was published. 2017 saw publication of the Paul Kossoff biography entitled Paul Kossoff: All Right Now - The Guitars, The Gear, The Music. Kossoff's unhappiness following the break up of Free and his drug addictions contributed to a drastic decline in his health. On a flight from Los Angeles to New York on 19 March 1976 he died from a pulmonary embolism after a blood clot in his leg moved to his lung. His body was returned to England and cremated at Golders Green Crematorium in North West London. His epitaph in the Summerhouse there reads: "All right now". One of Kossoff's guitars, a 1957 Fender Stratocaster, was bought after his death by Dave Murray of the band Iron Maiden; he used it from 1978 to 1990. 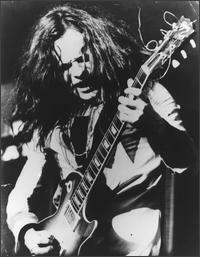 ^ "100 Greatest Guitarists: David Fricke's Picks: Paul Kossoff". The 100 Greatest Guitarists of All Time. Rolling Stone. ^ Dimery, Robert; and Macdonald, Bruno. Rock Connections: The Complete Family Tree of Rock 'n' Roll, p. 94. HarperCollins, 2010. ISBN 0-06-196655-X. Accessed 1 September 2011. "Green befriended another Anglo-Jewish guitar player Paul Kossoff, who formed Free"
^ Barker, Dennis. "David Kossoff: Actor and storyteller who charmed audiences on stage, screen, radio and in books", The Guardian, 24 March 2005. Accessed 1 September 2011. ^ Barker, Dennis (24 March 2005). "Obituary: David Kossoff". The Guardian. ^ "Champion Jack Dupree discography". WeGoNews.com. Retrieved 30 October 2011. ^ "Paul Kossoff". Find A Grave. Retrieved 29 March 2016. ^ "Iron Maiden's Dave Murray Talks About His 1957 Fender Stratocaster Guitar". Blabbermouth.net. blabbermouth.net. 7 May 2008. Retrieved 29 March 2016. Guerra, Tom. Paul Kossoff - Biography. Paul Kossoff - The Back Street Crawler Vintage Guitar Magazine, 2000. James, J.P. Paul Kossoff: All Right Now – The Guitars, The Gear, The Music. Matador, 2017. ISBN 978-1-7858988-1-5. This page was last edited on 24 February 2019, at 16:42 (UTC).